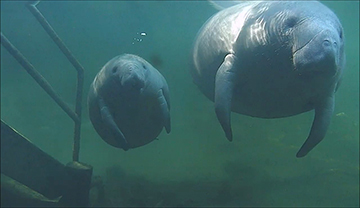 With your support, Save the Manatee Club will continue work to safeguard aquatic habitat and ensure that warm-water refuges are available to protect manatees from the cold. We will provide assistance with research and monitoring and the rescue and release of sick and injured manatees. Save the Manatee Club also advocates for strong protection measures, such as our support for safe and responsible boating, and provides free public awareness and education programs and materials. Your gift makes all this work possible. Please help us start 2018 strong by making a big impact for imperiled manatees and their aquatic habitat. Save the Manatee Club is dedicated to maintaining high financial and ethical standards, earning Charity Navigator Four Star and GuideStar Gold highest ratings. To make a tax-deductible donation right now to our organization, please fill out and submit the form below. To make a gift by phone please call 1 (800) 432-5646. Thank you for helping imperiled manatees! No Thank You Select this option if you would like your entire contribution to go to the organization. Save the Manatee® Club is a 501c(3) non-profit. Donations are tax-deductible. No goods or services were given in exchange for this contribution. Save the Manatee Club does not share, sell, or publish our donors’ names or addresses.